CNTF is a polypeptide trophic factor, member of the alpha-helical cytokine superfamily. It was initially purified from the chick eye on the basis of its ability to promote survival of E8 chick ciliary ganglion neurons in culture. CNTF is synthesized by glia both in the CNS and PNS3 and it has been demonstrated that CNTF is ubiquitously distributed in neurons and glia throughout the rodent brain. CNTF effects are mediated by a tripartite receptor complex consisting of two sigl-transducing subunits (leukemia inhibitory factor receptor, gp130) and a CNTF-specific ligand-binding-subunit (CNTFRa).CNTFRa is anchored to the membrane by a glycosyl-phosphatidylinositol (GPI) linkage and lacks the intracellular sigling moiety. It can be cleaved from the GPI anchor to yield a soluble form of the receptor (sCNTFRa).CNTF binds to CNTFRa, the latter associates with gp130 which recruits LIFR. This leads to the activation of a sigling cascade involving the JAK/STAT pathway.CNTFRa knockout mice die within 24 hours after birth as opposed to CNTF knock animals which are viable. This strongly suggest that CNTFRa has other ligands besides CNTF. Indeed, CLC/CLF complex (cardiotrophin like cytokine/cytokine-like factor-1) binds CNTFRa and activates a similar sigling pathway to that of CNTF. Yokota H, Yoshikawa M, Hirabayashi H, Nakase H, Uranishi R, Nishimura F, Sugie Y, Ishizaka S, Sakaki T.
Expression of ciliary neurotrophic factor (CNTF), CNTF receptor alpha (CNTFRalpha) following experimental intracerebral hemorrhage in rats. Neurosci Lett. 2005 Apr 4;377(3):170-5. Epub 2005 Jan 4. CNTFR polyclonal antibody (A01), Lot # 060501JCS1. 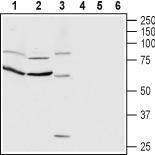 Western Blot analysis of CNTFR expression in A-431. 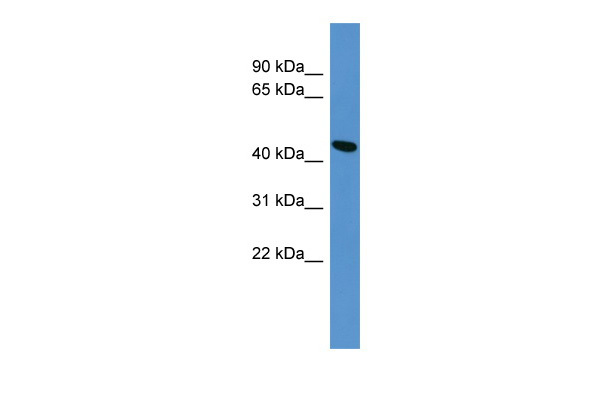 CNTFR polyclonal antibody (A01), Lot # 060501JCS1 Western Blot analysis of CNTFR expression in HeLa ( Cat # L013V1 ). CNTFR polyclonal antibody ( Cat # PAB7167 ) ( 0.3 µg/ml ) staining of mouse brain lysate ( 35 µg protein in RIPA buffer ) . Primary incubation was 1 hour. Detected by chemiluminescence. TA303173 (0.3µg/ml) staining of mouse brain lysate (35µg protein in RIPA buffer). Primary incubation was 1 hour. Detected by chemiluminescence. Western blot analysis of rat brain (lanes 1 and 4), rat cortex (lanes 2 and 5) and mouse brain (lanes 3 and 6) lysates: 1-3. Anti-CNTFRa (extracellular) antibody, (1:200). 4-6. Anti-CNTFRa (extracellular) antibody, preincubated with the control peptide antigen.